There’s a lot of space debris up there–and we’re not talking moon dust: Smashed rocket fragments, dropped tools, flakes of paint even all orbit the planet at dangerous supersonic speeds. There’s so much of this detritus, in fact, the USAF is planning a satellite to track it. An automated Russian cargo ship nearly missed docking with the International Space Station last week, and if it had it would’ve turned into a seriously large addition to the cloud of space debris–albeit short-lived. 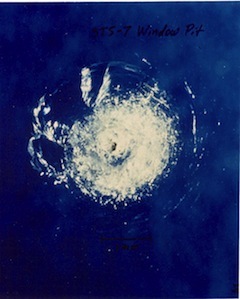 This cloud is dangerous stuff because of the fantastic relative speeds that orbiting objects can achieve: At 25 times the speed of sound, even a flake of paint from a spent rocket stage can cause serious damage–the Space Shuttle’s windows get regularly damaged by debris like this (as you can see in the photo below). And these many pieces are almost impossible to track using ground-based systems. These millions of smaller fragments just have to be dealt with on the fly, or treated as very low-probability risks to spaceflight operations. So, as more and more satellites fly into orbit, and more and more people than ever are in orbit at the same time, the risk to life, limb (and investors bank balances) creeps up with every launch. Enter, not the cavalry, but the USAF–with its plans to launch the SBSS. That’s the Space-Based Space Surveillance satellite to you and me, due to rocket into a 390-mile orbit on July 8th. Eventually a constellation of these things will be orbiting the Earth, giving a two-fold boost in sensitivity over previous space-based sensors, and a three-fold increase in probability of detecting “threats” to space craft. Data on precisely how the SBSS works is hard to come by with good reason: The SBSS is actually intended to supply data to the Department of Defense so that military folks can minimize the risks to U.S. space surveillance and communications assets. At least the military guys are being friendly with NASA, though. 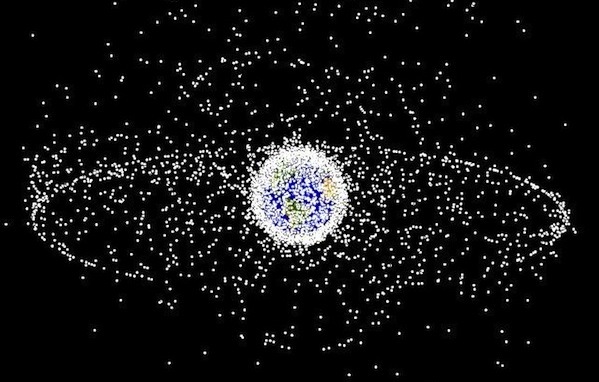 And why wouldn’t they, when data from the SBSS systems will be supplied to the agency so it can protect the International Space Station from deadly space junk?